Luke 2 is the second chapter of the Gospel of Luke in the New Testament. It contains an account of Jesus's birth and an incident from his childhood. Verses 1–19 except 2 are commonly read at Nativity plays as part of celebrating Christmas. According to the Gospel of Luke, Caesar Augustus ordered a census be conducted of the ".. entire Roman World", during Quirinius's governorship of Syria and this is the reason that Joseph and Mary, who lived in Nazareth, were in Bethlehem, King David's place of birth, when Jesus was born. Many English translations suggest that the purpose of the census was for everyone to be registered, but the King James Version and others state that everyone was to be taxed. The Expanded Bible explains that the register was compiled for taxation. According to the narrative in chapter 1, Mary had travelled from Nazareth to a city in the hill country of Judah, possibly Hebron, to visit her cousin Elizabeth, and then returned to Nazareth, then travelled again with Joseph from Nazareth to Bethlehem. 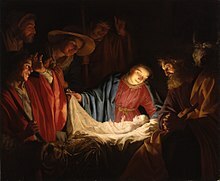 The accuracy of this date for the birth of Jesus has been disputed by many modern scholars. Luke then tells of shepherds working nearby who are visited by an angel who tells them that in Bethlehem, the "...town of David...Christ the Lord." had been born. "A multitude of the heavenly host" appear, praising God and saying "Glory to God in the highest, and on earth peace..." There is some discussion over the later part of the sentence the most usual modern interpretations being "... and goodwill to men", "... towards men of goodwill" or ".. to those he favours." The ASV has for example "...among men in whom he is well pleased." which corresponds to the third reading. The line is the opening part of the Greater Doxology, and as such important in the main rites of the Christian church. The angels then return to heaven and the shepherds go into Bethlehem to see for themselves and find Joseph and Mary and the infant Jesus. They then "...spread the word..." about the angels and Jesus, then return to their flocks. Luke does not mention of the Magi, the Massacre of the Innocents, or the escape of Jesus' family to Egypt found in Matthew 2. Luke 2:21 tells how Joseph and Mary have their baby circumcised on the eighth day after birth, and name him Jesus, as Gabriel had told Mary to do in Luke 1:31. Simeon's Song of Praise (also showing Anna) by Aert de Gelder, around 1700–1710. According to Leviticus 12, a woman was ritually unclean for forty days after giving birth to a male child. After this period, Joseph and Mary take Jesus to the Temple to complete Mary's ritual purification and to provide the sacrifice specified in the Law of Moses. Luke states that Joseph and Mary take the option provided for poor people (those who could not afford a lamb) in Leviticus 12:8, sacrificing "a pair of doves or two young pigeons." In the Temple, they meet Simeon and Anna. Simeon had been waiting for the Christ, and believes Jesus is him. Simeon prays the Nunc Dimittis (Canticle of Simeon) and tells Mary "This child is destined to cause the falling and rising of many in Israel, and to be a sign that will be spoken against, so that the thoughts of many hearts will be revealed. And a sword will pierce your own soul too." Anna, an old widowed woman who spent all her time in the temple praying, comes and praises Jesus as well. In vv:39-40 the family return to Nazareth in Galilee, where Jesus grows and becomes strong and wise. He receives God's favour or grace. Unlike the apocryphal gospels, no preternatural stories of Jesus childhood are found in Luke, or indeed any of the four canonical gospels. Verse 40 is echoed in verse 52. The Gospel then provides the only story of Jesus's childhood in the Canonical Gospels. When Jesus is twelve his family travels to Jerusalem for the Passover festival. Then they leave with a large group of their relatives and friends and after a day they realize Jesus is not with them. They go back to Jerusalem and after three days of looking find him in the temple talking with the temple teachers. His parents scold him for running off, but Jesus replies that they should have known where he was. "Didn't you know I had to be in my Father's house?". His family doesn't understand what he is talking about. They all then go to Nazareth. Jesus continues to grow and flourish both in wisdom and stature, and in the favour of God and man. This mirrors verse 40, and completes Jesus' early years. The next we see of him is in Chapter 3, verse 21, when he is baptised by John the Baptist. Wikimedia Commons has media related to Gospel of Luke - Chapter 2.